Nopal cactus, also known as Opuntia ficus-indica or more commonly, prickly pear, is found along U.S. roadsides in the desert southwest and throughout its native Mexico. It's used in Mexican cuisine, it's added to plaster as a hardener and it has long been regarded as a medicinal plant among the indigenous people of the Americas. Nopal is also gaining popularity in the U.S. for its health benefits, including the promise for treating inflammation and disease. The stems and fruits of Opuntia ficus-indica contain eight flavonoids, which have antioxidant properties. They're also high in vitamin C, and a study in the August 2004 "Journal of Clinical Nutrition" reported on a comparison between vitamin C and prickly pear fruit to see if there were differences in antioxidant potency. Although both decreased oxidative damage to lipids and improved antioxidant status in healthy humans, only the prickly pear fruit significantly affected body oxidative stress. Ethanol extracts from prickly pear cactus fruit and stems were prepared and used to evaluate the pharmacological activities of the plant. A study from Korea, published in the "Archives of Pharmacal Research," found that both extracts suppressed paw edema in laboratory animals and had a potent inhibitory effect against leukocyte migration, which is an important mechanism in the development of inflammatory diseases. 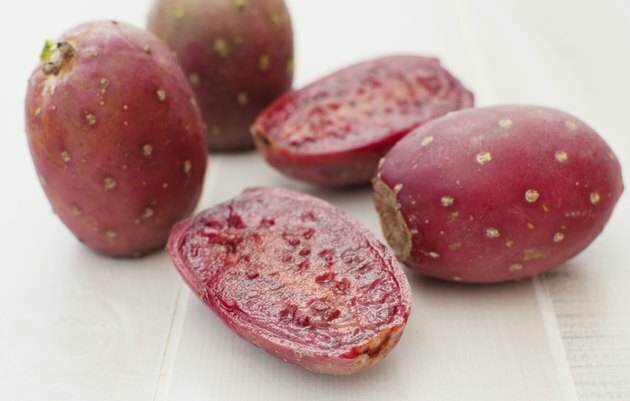 In studies led by Dr. Maria L. Fernandez in California and published in the "Journal of Nutrition," prickly pear pectin decreased LDL concentrations and led to a 28 percent drop in total cholesterol levels. Furthermore, Mexican researchers found that animals fed raw nopal had lower weight gains and a 34 percent reduction in LDL cholesterol levels. Nopal has been studied for its effects on blood sugar levels, with one study published in the "Journal of Ethnopharmacology" in 1995 finding the cactus extracts caused a significant decrease in blood glucose values by almost 18 percent. The Calzada Tecnologico in Baja California also discovered that adding nopal to traditional high-carbohydrate Mexican meals among patients with Type 2 diabetes induced a reduction in glucose concentration after the meal. The Opuntia ficus indica (nopal) cactus has been used in Sicily folk medicine for years to treat gastric ulcers. Italian scientists pre-treated laboratory animals with nopal before inducing gastric ulcers and found that the pre-treatment provided a protective action against the ulcers, most likely from the mucilage present in the plant. What Are the Side Effects of Eating Nopales? What Are the Health Benefits of Policosanol?